Home Back Forward June 17, 1998: Playing with the Cubs! Hi James, No worries about comments. Never quite sure how much to write. Hope you got that aerial. It wasn't the one I tried to compress. Boy, sometimes I could scream!!! But no. It will sort out. 3 pics today and individual notes. Think we will take a break for a few days after this one. Maureen: Yesterday and today have been like last year with the cubs. They seem more relaxed around me and I around them. I sat in a bear nest overlooking the lake with them yesterday. They slept and I felt privileged to be so trusted by these three. They jump up at the least little noise though and given the precarious perch of the nest I got a bit of a jolt, fearing I would slide over the edge. I am surprised at the increase in size of their paws and heads. All their fat of last fall is gone along with their thick fur. They are all three pretty bleached blondes due to being out of their dens so early. Charlie thinks they likely came out in mid April. They continue to be extremely careful around me trying to judge just how friendly I want to be. Biscuit continues to favour me; while Chico goes right to Charlie. The artistic one, Rosie, is a bit ambivalent to us both - she hasn't chosen a favourite. I have been thinking I am now ready to start on my art work. It really takes a bit of shedding the busy outside world. I feel very focused this year and will develop three components for the art exhibition titled "The Bears Point Of View" over the next 3 months. One aspect is the audio visual one I am calling "In Situ" and will be recorded and filmed to bring attention to an area in the world I think should be left as it is with all its bears and wildness left as it is. The second component is to create casts of many bear tracks to create a pathway a gallery viewer can walk upon on entering the exhibition. The last component is to be titled "Anthropomorphism" . I will complete a series of paintings that will use a combination of abstraction and realism to look at the feelings of bears that are similar to man's. 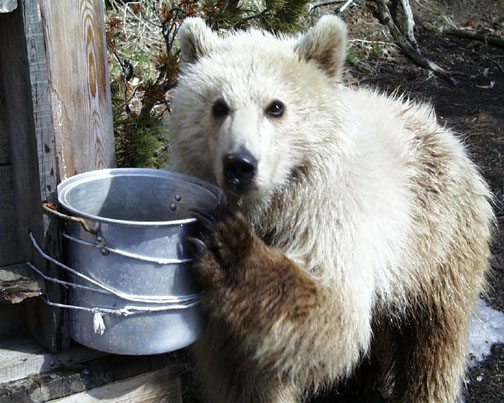 Charlie: In some ways Maureen and I feel like poor substitutes for a mother for our 3 cubs. They have correctly figured out that they cannot rely on us for many of the hazards they encounter. 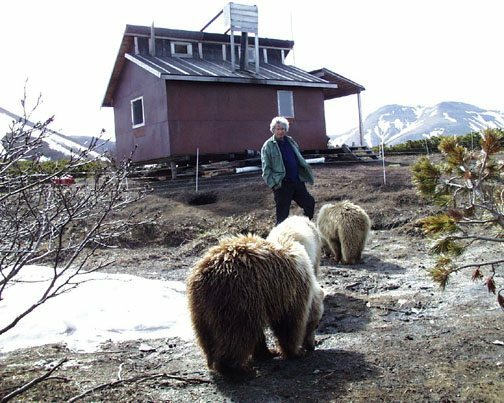 They have never relied on us for protection from male bears who do predate on cubs;some specializing in them as a food source. Our cubs have worked out some effective ways to stay alive: First of all they have come to know this area on the north side of Kambalnoe Lake extremely well. They have learned that these large males can run very fast over flat ground but are slower than they over rough terrain. Cliffs are their favourite refuge and they often sleep on small ledges high above the valley. During the last two weeks they seem to have noticed that large bears avoid going out on the weak spring ice on the lake. When another bear shows up they quickly head out onto the ice leaving their pursuer behind on shore. With the melt they have also discovered that there are fish frozen into the ice from some sort of die off last winter. 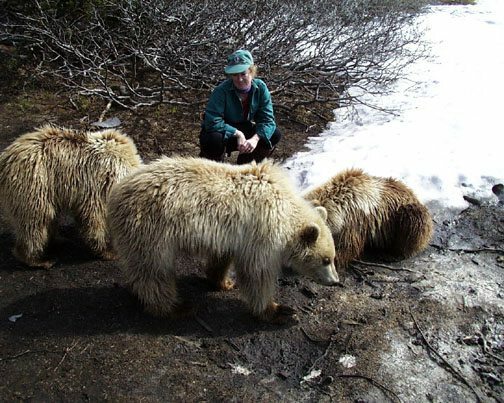 Thirdly, they have learned that the three of them together in a bunch pose some kind of a formidable threat to other non-aggressive bears who even run from them on occasion. After seeing them survive thus far, which includes a long tough winter, we are more and more impressed at the power there is in the combination of intelligence and well developed instincts.